Like most national recreation areas in the Southwest including Golden Gate near San Francisco and Whiskeytown-Shasta-Trinity north of Redding, Santa Monica Mountains northwest of Los Angeles is known not for spectacular natural landscapes, but rather as a center for many kinds of leisure pursuits, in this case walking, cycling, camping, horse riding and nature study on the hills, and all the usual beach activities along the coast. The NRA is one of the lesser NPS preserves in California, created fairly recently (1978) and not well signposted, since although large in size (240 square miles), most of the land is also part of various smaller protected areas, promoted more visibly - about two dozen state parks, state beaches, county beaches, wilderness parks and ranches, extending for over 30 miles of mountainous land between Oxnard and Hollywood, bordered on the north side by San Fernando Valley and to the south by Santa Monica Bay. 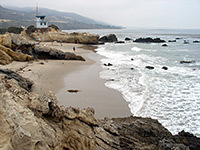 The four major components - all state parks - are Leo Carrillo, Point Mugu, Topanga and Malibu Creek. Most of the mountains are steep-sided and grass-covered, split by numerous narrow canyons, but the area also contains forests, reservoirs, rivers and agricultural fields, while the narrow strip of land bordering the Pacific Ocean has a near continuous strip of sandy beach, dotted with cliffs and other rock formations - a fair proportion of which is privately owned. 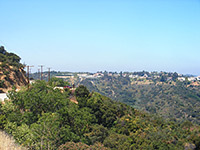 Within the boundaries of the NRA are various farms and villages, and several main roads running north-south, connecting San Fernando Valley with places like Malibu along the ocean. 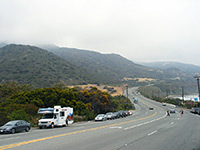 The most famous road, however is Mulholland Drive and Highway, which crosses the top of the Santa Monica Mountains from west to east for 47 miles, from the north Hollywood suburbs alongside US 101 to the Pacific at Leo Carrillo State Park (see map), and a drive along here is the easiest way to experience the scenery of the mountains. The east end of Mulholland Drive is not signposted from US 101 and is rather difficult to locate. It begins as an inauspicious side street branching off the western frontage road, and stays narrow for most of its length, often with a bumpy surface. The first few miles pass huge, expensive estates mostly well hidden behind high fences, security gates and shady trees, but there are a dozen or so pull-outs along the road next to viewpoints, marked with an NPS sign - the only visible indication that the road (though not the land at either side) is part of the national recreation area. Most look out northwards, towards Universal City and the San Fernando Valley, though as the highway runs close to the high point of the hills, it allows frequent views southwards as well, to Hollywood and Beverly Hills. The ever present haze tends to spoil most vistas, however. A few side roads lead to other areas of protected land within the NRA including Runyon Canyon Park, Laurel Canyon Park and Franklin Canyon. After 11.5 miles Mulholland Drive meets I-405 between San Fernando and Santa Monica, and although it continues on the far side, not far ahead is an unpaved section, closed to vehicles, so the westwards journey needs a 12 mile diversion: north along I-405, west on US 101 then south on Hwy 27 (Topanga Canyon Blvd). The next stretch of the road, now known as the Mulholland Highway, passes more residential districts for a few miles, until the houses are replaced by open countryside with rolling, grassy hills, scattered ranches and sleepy villages - pleasant scenery though a little nondescript. Hiking paths lead off into the hills, linking with the 67 mile Backbone Trail System that spans the whole length of the NRA, and the road also reaches several historic sites such as Paramount Ranch (a popular movie location in the 1930s and 1940s), and Peter Strauss Ranch - another venerable residence, built in 1926. Three other north-south roads cross the highway, providing direct routes to the beaches, and these seem to get the most traffic; roads in the hills are perhaps more popular with cyclists, who enjoy the curves and gradients. Eventually the Mulholland Highway curves southwards, descending a steep ravine (Arroyo Sequit) and meeting the Pacific Coast Highway in the middle of Leo Carrillo State Park. Leo Carrillo State Park occupies a small area of hilly land around the west end of Mulholland Highway including 1.5 miles of oceanfront, centered on a parking area and campground beside the junction of the road and CA 1, where a fee is charged for entry, though as with all of this part of the coast, Route 1 has wide verges where vehicles can park for no charge. The beach is unremarkable, again like most others nearby - narrow, overlooked by the road and separated from it by a thin strip of grassy bluffs, but always busy. Some parts of the beach are bordered by low cliffs that extend out to sea in places, forming small coves; other areas have pebbles and boulders rather than sand. One more unusual feature is a sea cave, extending for 100 feet or so through a section of the cliffs. Point Mugu State Park makes up the western end of Santa Monica Mountains National Recreation Area - several miles of rather inaccessible hills sloping steeply down to 7 miles of beaches and cliffs. The park has a paid parking lot near the east edge, and there are many other (free) areas to park all along the road towards the actual point, which is formed by a detached hill that forces the highway inland for a short distance. Another road once went around the south side of the hill but this is partly washed away, and a short section of the coast is closed due to unstable cliffs, which is a pity, as this is one of the most interesting parts of the shoreline. The rock formations at the point include a wave-cut natural arch, which can be seen by walking around from the west side. There is a nice beach further west, and another (Thornhill Broome) to the east, though most of the coast in the state park has boulders beneath steepish cliffs, so is not very enticing. All of the shoreline in the NRA is liable to be cloudy most of the day even though the sun prevails just a few miles inland, yet the road and the beaches are still busy on the dullest of days. 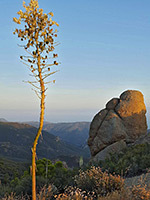 There are four other state preserves within the national recreation area. Topanga State Park covers a sizeable area of hills, meadows and oak woodland towards the east side of the NRA, accessed from either CA 1 or Mulholland Drive. The park is crossed by 36 miles of trails, many along disused fire roads. Malibu Creek State Park has similar scenery but is centered on a wide, slow-moving stream, flowing southwards and joining the Pacific near Malibu Beach, and so offers the added activities of fishing and paddling. Will Rogers State Historic Park preserves the home of the famous actor and comedian - a 30 room ranch surrounded by undeveloped land with short trails that provide nice views of the mountains and the Pacific Ocean. 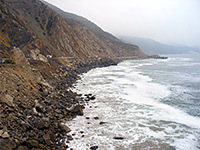 Point Dume State Reserve contains a small area of land at the very tip of Point Dume, bordered by the Malibu suburbs. The park contains a wide beach, ancient sand dunes and sheer, 100 foot cliffs at the edge of the promontory. Other sites within the NRA include Circle X Ranch, Charmlee Wilderness Park, Red Rock Canyon Park, San Vicente Mountain Park, Pacific Palisades Park, Solstice Canyon, Zuma/Trancas Canyons and Cheeseboro/Palo Comado Canyons. Accommodation is available in many nearby locations including Agoura Hills, Beverly Hills, Burbank, Calabasas, Camarillo, Oxnard, Santa Monica, Sherman Oaks, Thousand Oaks, Van Nuys and Woodland Hills; follow the links for hotel descriptions and reservations.